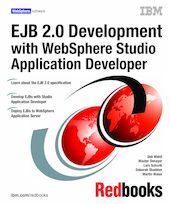 This IBM Redbooks publication provides detailed information on how to effectively use WebSphere Studio Application Developer for the development of applications based on the Enterprise JavaBeans (EJB) architecture, and deployment of such applications to a WebSphere Application Server. Throughout the book, we provide examples based on a simple banking application with an underlying relational database. In Part 1, we introduce EJBs as a part of Java 2 Enterprise Edition (J2EE) and cover the basic concepts and the architecture. In particular we point out the new functions introduced with the EJB 2.0 specification that provide, for example, enhanced functionality for container-managed persistence entity beans and message-driven beans. We also provide best practice guidelines for successful implementations of EJBs. In Part 2, we introduce the sample banking application and then implement entity beans, session beans, and message-driven beans using WebSphere Studio Application Developer. We also implement finder methods, different mapping strategies, and simple clients that use the EJBs. At the end, we describe how to deploy EJB applications to a WebSphere Application Server.